Christmas celebrations begin early this year, with the lighting of the town’s Christmas tree on Taos Plaza after Thanksgiving. The Turquoise Teapot, the only tea house in the town of Taos, is an English-style tea shop and gallery with a fabulous assortment of teas. Every year the owners serve a holiday high tea on December 4th. “We do a special buffet with season fare that includes Christmas sandwiches, truffles and cakes,” said Kathleen Smith, one of the proprietresses. “We also have live music (a wonderful harpist) and holiday wreaths.” Reservations are accepted for seating at 12 noon and at 2:30 p.m. The nine days before Christmas, taoseños reenact the holy family’s search for lodging in Bethlehem. A well known posada starts in San Francisco de Asís church, in Rancho de Taos. The peregrinos (pilgrims) sing traditional songs as they go to different houses and are turned away… until they finally find a “posada” in one of them and everybody is invited to come in and celebrate. There are other posadas going on around town, in churches as well as in private homes. There is another special Christmas event for music lovers at the Harwood, “A Classical Holiday,” that will take place on December 18 at 7:30 p.m. in the Arthur Bell Auditorium. Taos Chamber Music Group celebrates the holiday season with a program of music from the 18th and early 19th centuries. Tickets are $18 in advance; $20 at the door and $10 for children under 16. Taos Ski Valley offers a variety of activities for all ages and tastes. Celebrations up there begin with the Brewmasters Festival on December 18th from 4:30 p.m. to 7:00 p.m. Though not a Christmas activity as such, it is definitely a fun event… for those twenty-one and over. It takes place in Tenderfoot Katie’s and the Martini Tree. Admission is $25 and the fee includes souvenir sampling glass, good food and great entertainment. Come and sample beers from twenty-five breweries from across the southwest region! It all starts at the base of lift #1 at 6:00 p.m. Watch a torchlight parade and fireworks display and follow it with the countdown to the New Year in the Martini Tree Bar. Welcome the New Year with fireworks and music while the mountain sings its winter song! You can enjoy luminaria displays in many other streets and try bizcochitos (spicy, anise-flavored cookies) all over town. 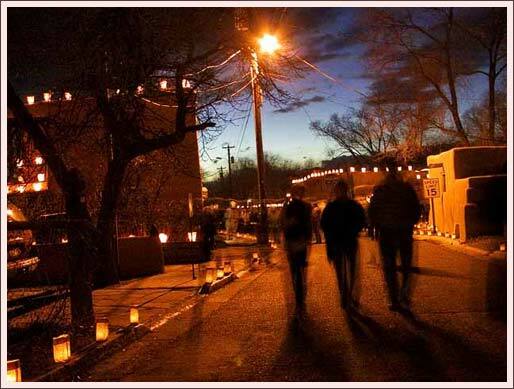 Christmas in Taos is a flavorful, colorful and light-filled holiday. Just remember to keep your feet warm when Christmasing around.